ACDI Sponsors The Ride For Jillian! 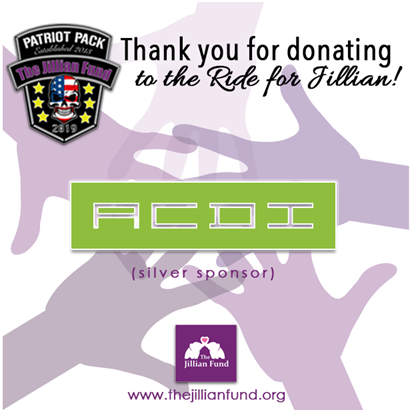 | Industry Analysts, Inc.
ACDI is once again sponsoring The Patriots Pack on their Ride for Jillian! The Patriots Pack riders will be over 15 strong this year and will include a chase vehicle, generously sponsored by MARS International. The Jillian Fund was started by Ricoh’s George Gorman after the loss of his daughter. This amazing charity makes sure parents can afford to with their terminally ill child, often at the end, rather than having to work. It literally keeps the lights on. Thank you, Josh Lane and ACDI, for your incredible donation to The Jillian Fund and The #RideforJillian! Your generosity and support of the families is next to none. Thank you for your contribution year after year! This entry was posted in ACDI and tagged ACDI, The Jillian Find, The Patriots Pack, The Ride for Jillian by IA Staff. Bookmark the permalink. ← Previous Previous post: The Ride For Jillian – Sponsor Info and Details!